Hyundai’s Santa Fe as the company’s first ever SUV has a very good reputation in Asia and parts of Europe. But It’s not the same for it in America. Now in 2010, the Korean firm is offering an updated version of the car with a brand new engine in hope to make things better. 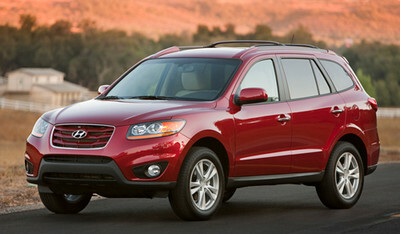 Visually, the 2010 Santa Fe has the same overall shape as the previous model. There are only a few modified parts here including the new grille, head and taillight’s graphic, revised bumpers and new tailgate plus new wheels. Inside, you get a new steering wheel, a new wood trim with higher quality and a number new toys like Bluetooth connectivity system and top-notch stereo. But Hyundai does not offer third row seats option in the new model. The new Santa Fe also gets the firm’s new four-cylinder 2.4 liter 175hp gasoline engine which replaces the old 2.7 liter V6, offering better performance and fuel economy. The other choice of engine is a 3.5 liter 276 hp V6. Pricing for this car starts at $21,695 for the basic model and goes up to $30,295 for a fully-loaded V6-powered one. It’s still good value for money.